San Miniato is a small Italian hill town just outside Florence. In medieval times, the town connected northern Europe and Rome, and today its hilltop landscape is dotted with luxury tourist lodgings scattered between landmarked palaces, seminaries, and homes. Arising from this historical context is the town's newest building, Casa Verde, a mental health facility for young women. 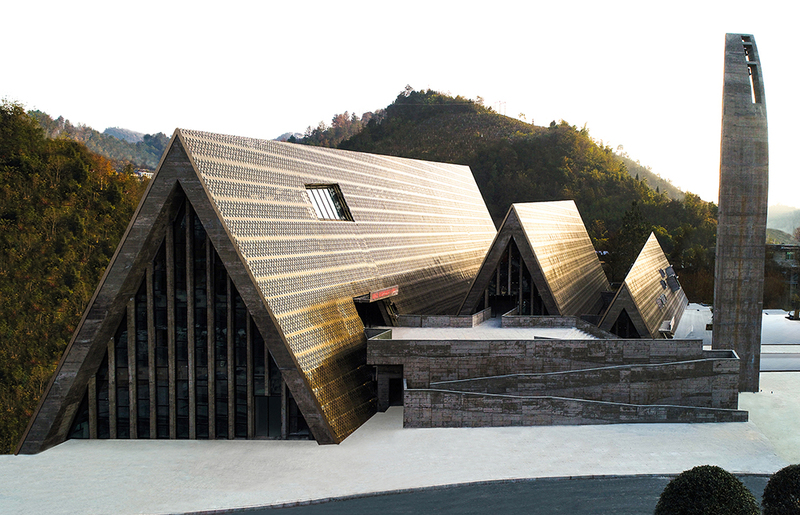 The project is inspired by historical and social values of “home” paired with the spirit of the forested surroundings. 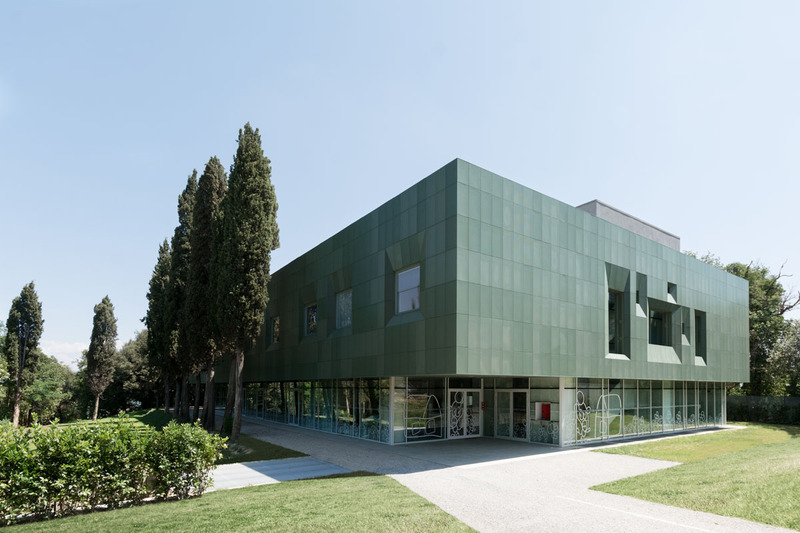 A loose arrangement of dormitories are arranged around a central courtyard and clad with a perforated green metal skin that is held off of ground level to offer transparency to the surrounding landscape, which is peppered with centuries-old cypress trees. Casa Verde prioritizes social sustainability as well as sustainable land use. Hillside maintenance efforts were supported by reusing existing foundations from vicoli carbonai, or charcoal alleys, which were developed in the Middle Ages as an extension of San Miniato’s defensive system. 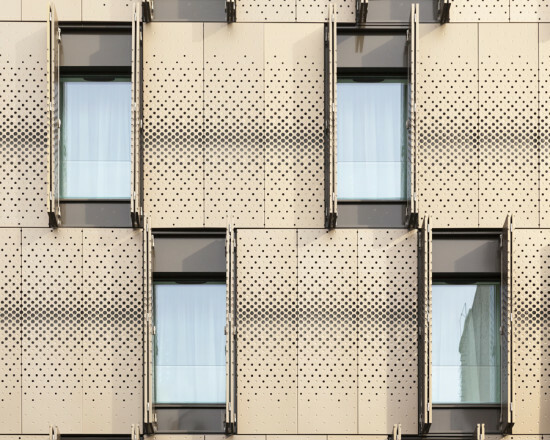 Lightweight paneling on the facade helped minimize dead loads on the foundation to maintain the slope stability. Art by and about the patients has shaped the facility. Drawings from younger patients were edited, scaled, and applied to the ground floor glazing system, while Italian artist Mercurio-S17S71 created Shamans, a contemporary work that features portraits of Casa Verde’s patients. 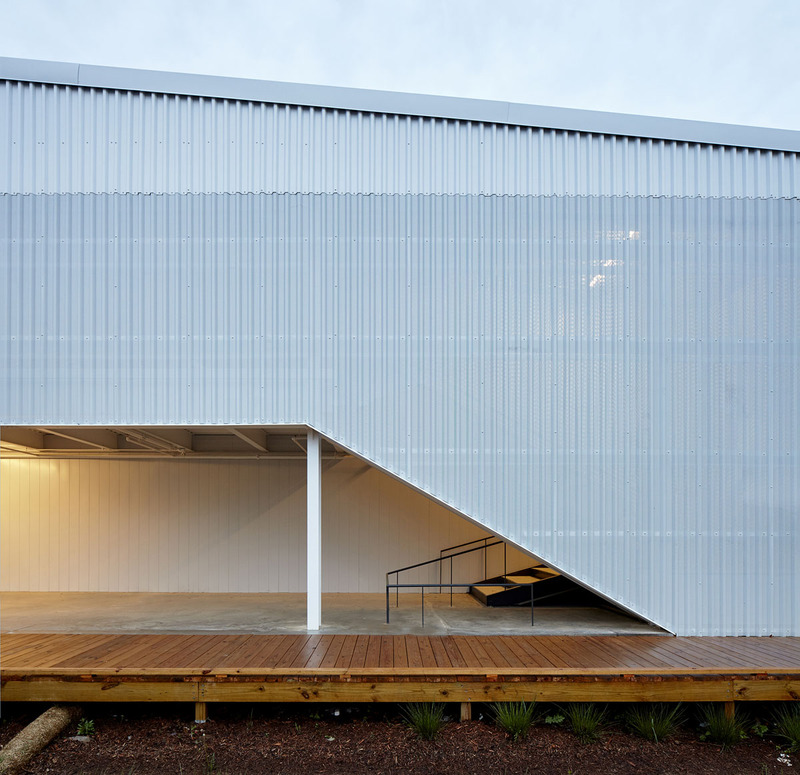 The extension to the existing orphanage was sensitively planned to protect the formal massing of the original plan, while additions to the complex are articulated through more contemporary expressions of shape and material. Openings on the main elevation connect users of the existing structure to the addition. The facade coloration results from a study of leaf shades in different seasons. 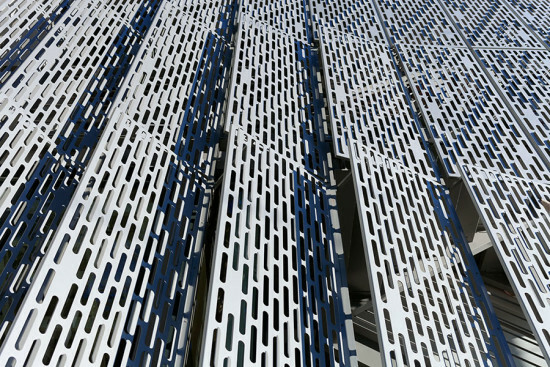 Like a full tree canopy, the facade’s perforated screens are perceived as porous from up close, but massive and opaque from afar. 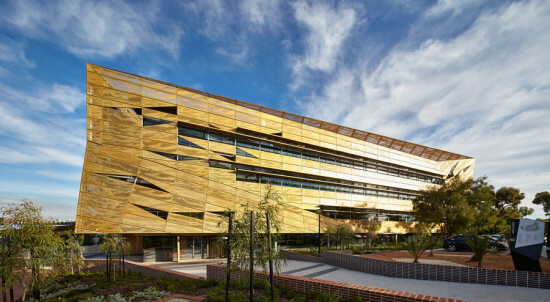 Openings in the metal panels filter daylight while ventilating the thermal envelope beyond the screen. Beyond the facade, the architect explained that the interior spaces were purposefully designed in a minimal scheme to “recreate the feeling of being in a carded wool space (in view of neuropsychiatric disorders).” A base light gray color is paired with a color scheme of greens, blues, and oranges that covers furniture and architectural detailing to delineate the facility’s services. [beforeafter] [/beforeafter] The perforated aluminum skin would replace the previously proposed glass facade. 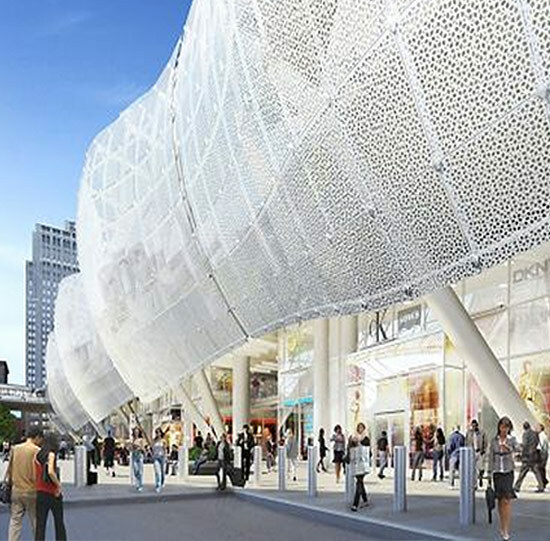 (Courtesy TJPA) It looks like Pelli Clarke Pelli's Transbay Transit Center, which stretches about three blocks through the city's Rincon Hill neighborhood, might go ahead with its first major piece of value engineering. 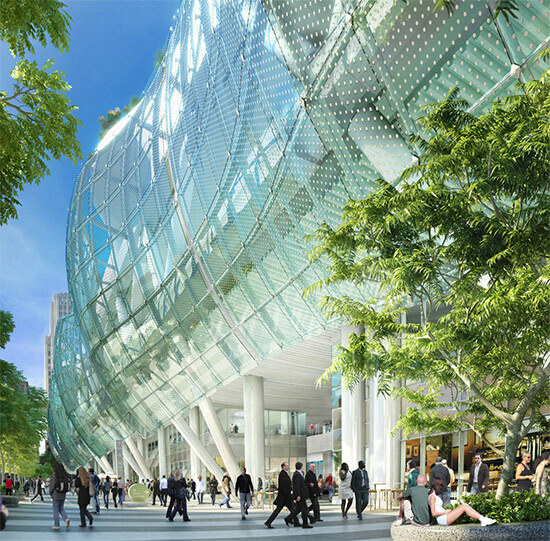 According to the San Francisco Chronicle, the architects have suggested that the building's undulating glass skin become perforated aluminum. The move would meet federal safety guidelines and chop $17 million from the estimated $1.59 billion budget for the center's first phase. 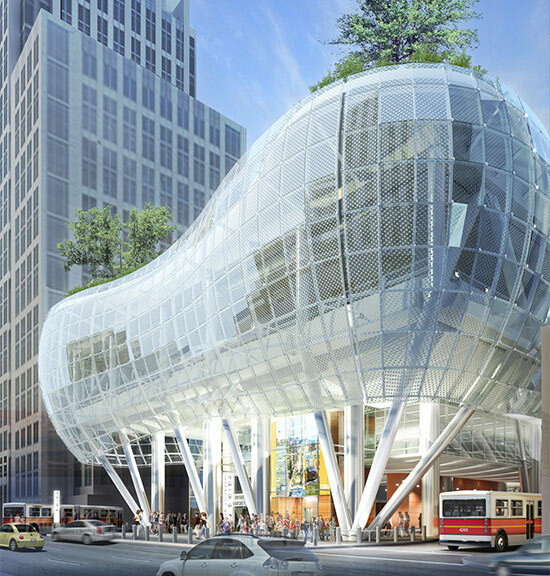 The Transbay Joint Powers Authority (TJPA) board will be asked to approve the change at its March 25 meeting. The structure is not expected to be complete before 2017. [beforeafter] [/beforeafter] "This is a dramatic change in material, but the philosophical change is not enormous," said Fred Clarke of the firm Pelli Clarke Pelli, who said the terminal would still feel light, not heavy. 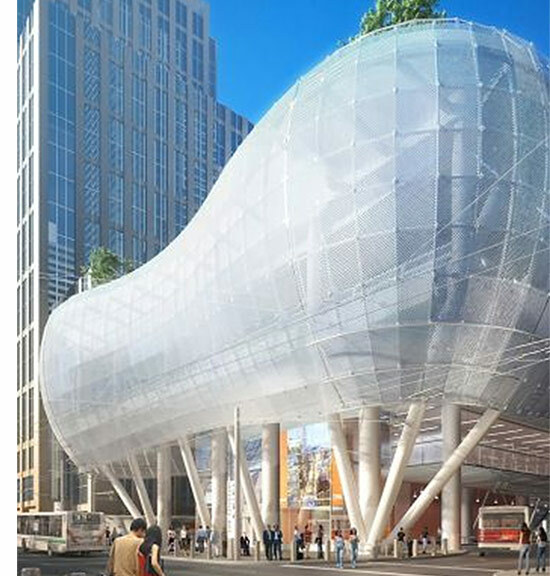 Chronicle critic John King warned that the move "could make the transit center less of a sinuous, snaking form—and more of a drab block—as it spans First and Fremont streets." On Pelli's side, Clarke argued that the wrapping would still be transparent. 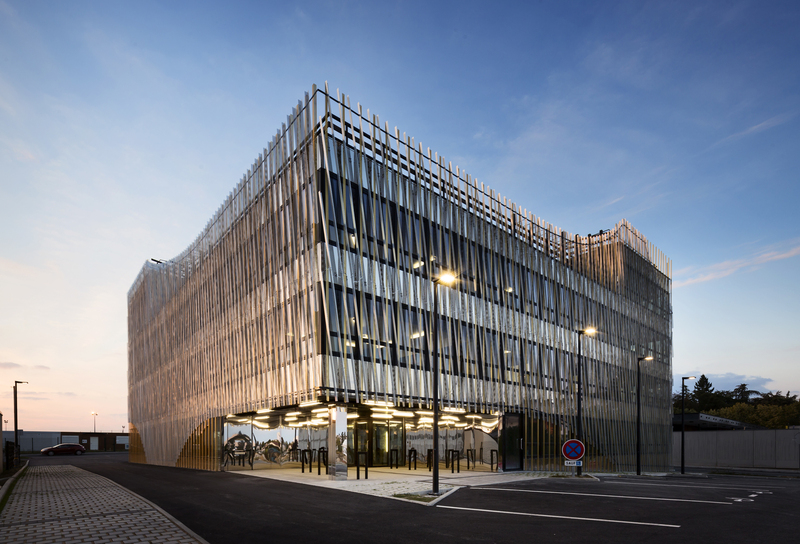 Of course he admitted: "Architects who do this kind of building must be very, very pragmatic."